Welcome back to Dairy Farmers of Canada’s #CanadianCheese of the month club! 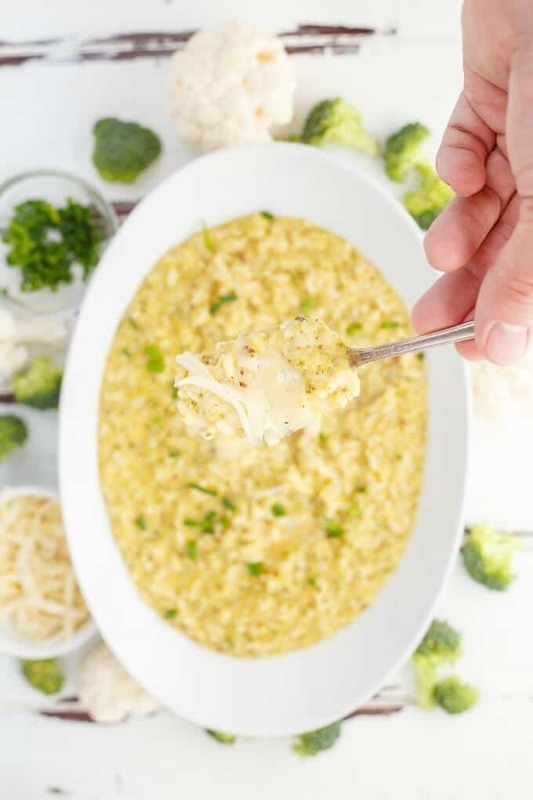 Today’s Cheesy Broccoli-Cauliflower Risotto uses a cheese from Manitoba, and it will surely knock your socks off! We have never had a cheese like this one! 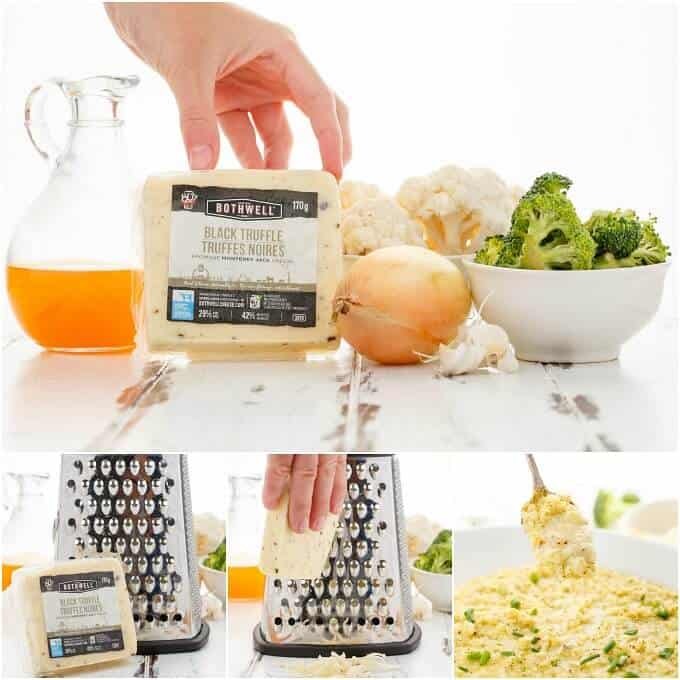 Today’s cheesy broccoli-cauliflower risotto uses our first prairie cheese in this campaign: Black Truffle from Bothwell Cheese located in New Bothwell, Manitoba! When it comes to risotto, Parmesan is the star. However, over the years people have become comfortable using other types of cheeses. Personally, I find that you just want something bold, maybe on the saltier side, and something that will not become lost in the dish. So when we sliced into Black Truffle for the first time, both my husband and I immediately said: risotto! Black Truffle is BOLD! 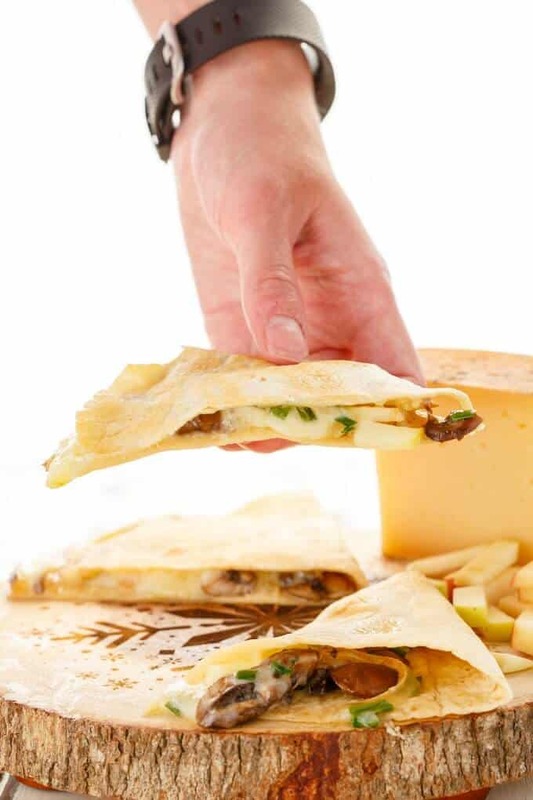 It is a Monterey Jack cheese with pieces of Italian Black Summer Truffles blended throughout. My husband said it was garlicky in flavour, and I have to agree in a way, but it was the aftertaste that stood out the most. Almost sweet. I really do not know how to describe the flavours here as they were so good, and so rewarding, that maybe my brain just went into a trance! All I know is that this cheese is now my go-to for risotto! With a combination of earthy, complex flavours, Black Truffle stands out remarkably well in this cheesy broccoli-cauliflower risotto. And that is a big plus in my books because the last thing you want to do is mask this Canadian cheese! Especially with all the pride and care that goes into making it!! Bothwell Cheese began in 1936 as a co-op of dairy farmers in New Bothwell, Manitoba. To this day they believe that the highest quality standards create the best tasting products. And rightfully so, as you can tell immediately from the first bite of Black Truffle that this is unlike any other cheese. Since Black Truffle is a semi-soft, it makes for a great fondue cheese. And since it melts so well, it works perfectly in our broccoli-cauliflower risotto! Did you know risotto gets all its creaminess from cheese? Yup! No milk or cream (though some do add these extra fine ingredients.) The cheese does all the work! 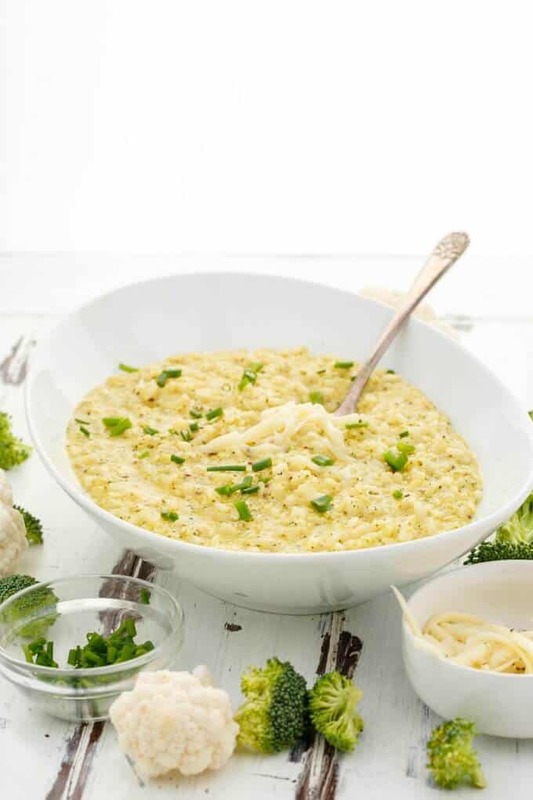 With the addition of raw, riced cauliflower and broccoli, you may use a bit more stock than you usually do but you are still rewarded with an awesome, creamy risotto! 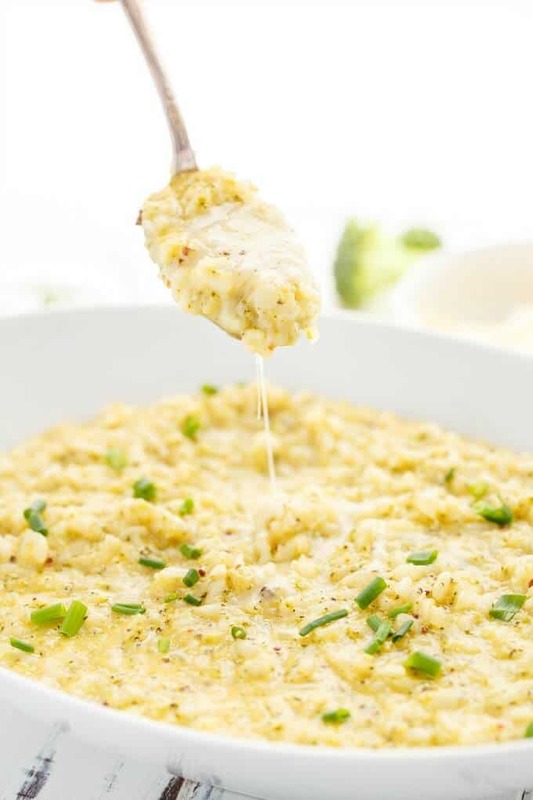 Risotto makes for a great appetizer, side, and main dish! I mix my coarse mustard into the simmering broth so it disperses evenly. Add two tablespoons butter to a sauté pan, melting over medium-high heat. Add the onion and cook until translucent and tender, about 3 minutes. Season with salt, pepper, and chili flakes. Pour in the rice and cook for a good couple of minutes. Carefully pour in white wine. Lots of steam will appear as the liquid touches the pan. Quickly stir the bottom of the pan with a spatula so you can get all the nice brown bits up. 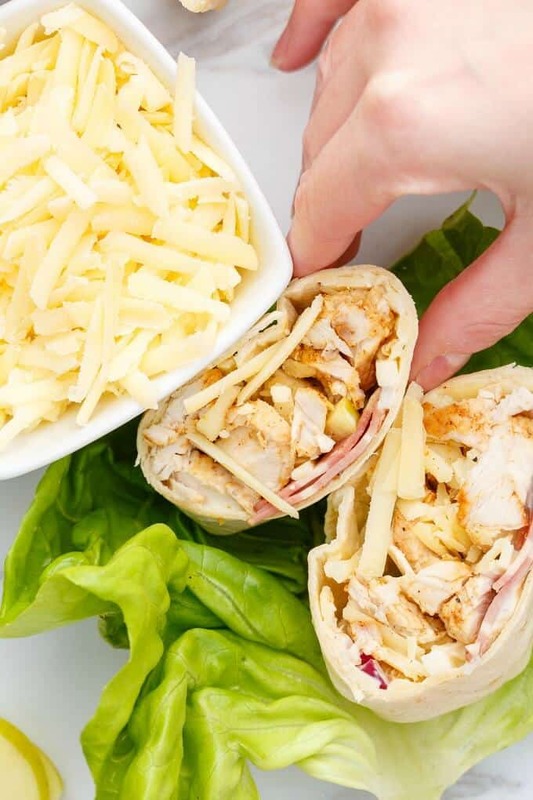 Stir in the cheese and mix until it is melted. Stir in last tablespoon of butter. Serve immediately with chives if desired! Make sure your broth is at a good simmer because cold/warm broth won't cut it for risotto! Don't pre-rinse your rice! Since I love this cheese so much, I had to find out where I could order/pick it up from and the people at Bothwell Cheese were kind enough to locate the closest store to my house that carries their cheeses 🙂 You can search their website here to find the nearest retailer!